BIPARTISANSHIP — the real thing — is a rare commodity in Washington, and something to celebrate when it happens. It happened, for a few brief shining moments, on Tuesday night. 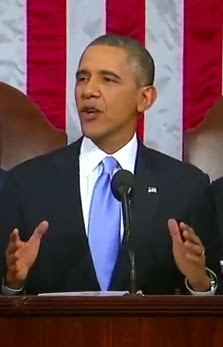 President Obama made his fifth State of the Union address at the U.S. Capitol on Tuesday night. In an address that got generally high marks as a relatively genial call to action, the president was applauded 80-odd times at various points. At one point, though, the president of the United States became merely the supporting lead, the reflector of prolonged applause. For nearly two galvanizing, wonderfully nationalistic minutes, the star of the show, Army Sergeant First Class Cory Remsburg, was in the balcony. “I first met Cory Remsburg, a proud Army Ranger, at Omaha Beach on the 65th anniversary of D-Day. Along with some of his fellow Rangers, he walked me through the program — a strong, impressive young man, with an easy manner, sharp as a tack. We joked around, and took pictures, and I told him to stay in touch. 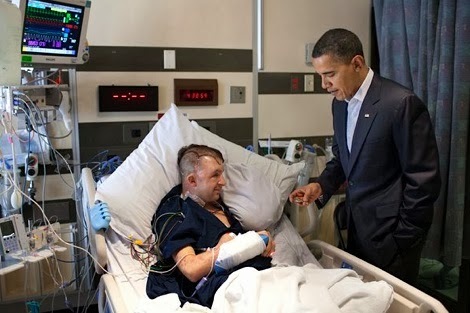 “A few months later, on his tenth deployment, Cory was nearly killed by a massive roadside bomb in Afghanistan. His comrades found him in a canal, face down, underwater, shrapnel in his brain. “For months, he lay in a coma. The next time I met him, in the hospital, he couldn't speak; he could barely move. Over the years, he's endured dozens of surgeries and procedures, and hours of grueling rehab every day. 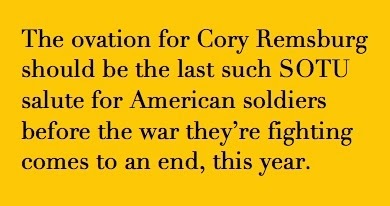 “Even now, Cory is still blind in one eye. He still struggles on his left side. But slowly, steadily, with the support of caregivers like his dad Craig, and the community around him, Cory has grown stronger. Day by day, he's learned to speak again and stand again and walk again – and he's working toward the day when he can serve his country again. WHAT FOLLOWED was the kind of tribute the State of the Union was built for, and a truly moving experience. From everyone in the House Chamber there came cheers, tears, whoops and sustained, unbridled applause — not the perfunctory wave of claps reserved for dignitaries and visiting strangers, but nearly two minutes (Rachel says it was 1 minute and 44 seconds) of appreciation for one who’s borne the battle. Regardless of who he voted for. Remsburg, who attended the SOTU as a guest of First Lady Michelle Obama, sat beside his proud father in the balcony, and offered the crowd a thumbs-up — gung ho even now. Time.com reports that the recipient of the Bronze Star and Purple Heart lives in Phoenix, and confronts the grueling ritual of six hours of occupational, physical and speech therapy, every day. 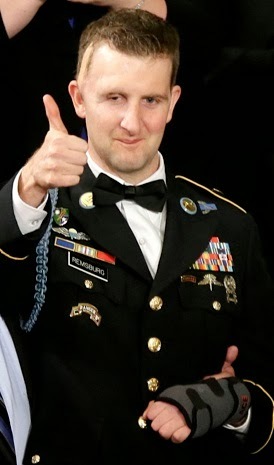 The echo of his appearance gives us another reason for our own, more muted, private applause: The thunderous ovation Cory Remsburg received on Tuesday should be the last such State of the Union salute for American soldiers before the war they are fighting comes to an end, by the end of this year. Image credit: Cory Remsburg: Associated Press. Remsburg and Obama: Pete Souza/The White House. It’s a measure of the president’s singular rhetorical skill that this year’s State of the Union address — by turns anodyne and ambitious, ameliorative and pugnacious — managed to invoke some of last year’s themes, and the last SOTU’s language, without looking dated. Mostly because much of what was important last year is still of top-shelf concern today. Expressing the hope that 2014 can be “a breakthrough year for America,” Obama last night held out the interparty olive branch the SOTU tradition demands, even as he let the Congress and the nation know that he’d go it alone if necessary, ready to embrace the idea that, sometimes if you want something done right, even partially, be prepared to do it yourself. Alla that was the honeyed part of the speech. The habañero part came later, when the president confronted Republicans with what he is prepared to make their future. “[W]hat I offer tonight is a set of concrete, practical proposals to speed up growth, strengthen the middle class and build new ladders of opportunity into the middle class,” Obama said. THAT HEFTY little bon mot went out to a Democratic base eager for Obama to make best and highest use of the presidency to get something accomplished. 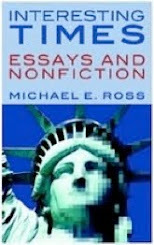 Those sentences will awaken happy memories of the 2008 Obama, fiery and sharp with possibilities. The president was also master of the physical game last night, his mien upbeat and forward-leaning, his stride almost defiant, his delivery as on-point as ever. And what he promised he delivered: a call to Congress to “undo the damage done by last year's cuts to basic research so we can unleash the next great American discovery.” A call for patent reform “that allows our businesses to stay focused on innovation, not costly and needless litigation.” An appeal for more and stronger federal partnerships with states and communities to improve pre-K education. A demand for legislation enabling more vehicles’ use of natural gas, to continue the shift away from foreign oil. The expected appeal to Congress to restore unemployment benefits for 1.6 million Americans, taken away by that body one month ago. And oh yes, there was a refreshingly full-throated cry for an end to the income inequality that precedes the current trendiness of the phrase. “You know, today, women make up about half our workforce, but they still make 77 cents for every dollar a man earns. That is wrong, and in 2014, it's an embarrassment. Women deserve equal pay for equal work. And in a move to change the conversation on changes to the minimum wage, Obama dropped a challenge flag to the Republicans like nothing else could. YOU CAN get a lot done in one appearance on “Meet the Press.” Just ask Rand Paul. In one visit to the long-running NBC news program, the maverick ophthalmologist senator from Kentucky managed to both indulge in false equivalency meant to show how women had already achieved economic parity with men, and to disinter the remains of the Monica Lewinsky scandal, as a joint swipe at former president Bill Clinton and Hillary Clinton, a possible Paul rival in 2016. Maybe never has a politician achieved so little in so little time. On Sunday’s “MTP,” Paul launched into a disquisition about the state of American women today, with the women in his own cloistered family world enlisted to stand in for women everywhere. Paul was pressed by “MTP” host David Gregory to respond to comments his wife made about former president Bill Clinton in the wake of the Lewinsky affair, in an article in last September’s Vogue magazine (the one where Rand Paul and one of his sons made like Ralph Lauren models). When Gregory pressed him on it, Paul admitted that the former president’s actions shouldn’t reflect on the former secretary of state. “It’s not Hillary’s fault, but it is a factor in judging Bill Clinton in history,” he said. But then, in a very cheap-shot note, Paul made a comment on the Clintons’ close personal and political relationship, saying that “sometimes it's hard to separate one from the other.” Let’s see now, proposing that members of his own family be used as a control sample for average American women ... needlessly reawakening a settled controversy over a former president ... and implying that that president’s wife is fully interchangeable with her spouse. Not a bad day’s work. MOVES LIKE this show why Rand Paul has endeared himself to Tea Party regulars. He’s king of the political quick hit, just the kind of opportunist who’d punch you walking down the street. Or try to, anyway. That’s Paul’s weakness; he’s often punching above his weight, but mostly taking swings that fail to connect. Maybe never more so than with this bizarre attack on a former president of the United States. Paul has a two-pronged problem here. First, he proposes to exhume the matter of one president’s case of moral failure, an issue that was thoroughly adjudicated, something that most of the American public thought was cut and dried and dead and buried more than a decade ago. There’s no relevancy of this to the current national agenda. Whatever the short-term fallout for the 42nd president, Clinton weathered that ancient storm and has gone on to occupy a bigger, wider role in world affairs, a U.S. president become a global statesman held in high regard. Paul’s smear campaign was dated and out of step the minute he thought of it; such tactics just make him look petty and desperate. The second problem for Paul is one of not really thinking of his audience, or knowing who his audience should be if he’s serious about 2016. It’s a given that the Tea Party for whom Paul is ne plus ultra absolutely delights in spanking Democrats, a way of emotionally stoking the fires of the conservative base. Rand Paul could quicken the blood of Tea Party conservatives by saying Bill Clinton had an impure relationship with a ham sandwich; some in that number would swear it was the truth. But beyond the primary calendar, there’s no electoral future in preaching to the choir, those conservatives already predisposed to sing Paul’s praises. If this is a sop to the forces that be, it’s thematically predictable (and therefore acceptable to those base voters). If this is a bid for pertinence beyond the base, Paul’s got work to do. And he’s making more work for himself as he goes along. This is partly a matter of demographics. 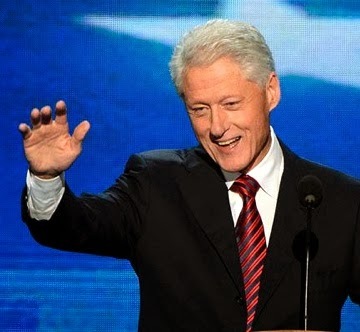 For Paul’s barbs about Bill Clinton to find their mark, people have to remember Bill Clinton. The verdict already handed down in the court of public opinion — one that supported Clinton and largely dismissed his 1998 impeachment as a case of grossly partisan congressional overreach — will suffice for those old enough to remember the Lewinsky scandal. PAUL ISN’T thinking of the deep future, and the fact that 2016 will be the first presidential election for those 3.9 million Americans who were born in 1998 — the year Bill Clinton was impeached. For them and others born around the same time, there’s no memory of that event; that makes Paul's effort to reawaken outrage over this even more of a waste of time than it was already. Americans who weren’t around then couldn’t care less. 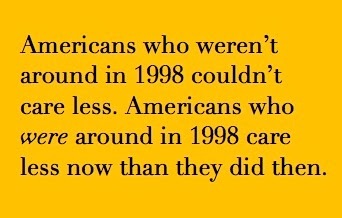 Americans who were around then care less now than they did in 1998. There’s just too much going on right now, right in front of our faces, that’s way more important. Paul’s gambit is a cynical revisitation of the past, a trip back to somewhere we shouldn’t have been in the first place. Now, with millions more Americans who either don’t remember anything about it, or who don’t want to ... what’s the point? Nothing to see here, folks, and certainly nothing new. 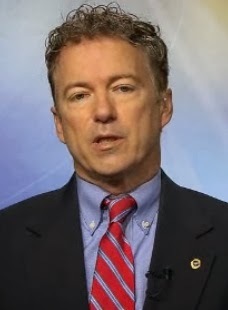 Whatever the reaction of the base to Paul’s shot at Bill Clinton, there’s no disguising the fact that it’s nothing more than a trip to the butcher shop for more of the same red meat that Rand Paul and other Tea Party acolytes have been feeding their crowd for a long time. Of course if Paul does run for president in 2016, he’s obliged to run the bases in the right order, and that means focusing on the primary season first. That task demands shoring up the conservative-base voters he’d need to win early. But alienating women voters, and rhetorically conjuring sordid memories of Bill Clinton when millions of voters don’t have memories of Bill Clinton, will do nothing to expand his appeal beyond the base. And ultimately, if he can’t expand beyond the base, he can’t win. Image credits: Paul: NBC News. Clinton: James Keivom/New York Daily News. ANYONE SEEKING a sign of the multiple personality disorder of the Republican Party will get more than they bargain for on Tuesday, after President Obama’s State of the Union address. The rebuttal to the State of the Union, by a member of the president’s opposing party, has been a tradition since the 1960’s. Not always, but often as not, it’s been a one-for-one proposition. That all changed with the advent of the Tea Party offshoot of the Republican Party. Since their rise in 2009, Republican responses to Obama SOTUs have been of two flavors: Regular and Extra Outraged. But this Tuesday, Americans can indulge their love of rhetorical choice even more, as the GOP presents three rebuttal responses to the State of the Union address. Rep. Cathy McMorris Rogers of Washington state, Sen. Mike Lee of Utah and Sen. Rand Paul of Kentucky will collectively offer the three opinions of the Republican Party. That three-ring circus, following the president’s main event, will respond to the particulars of the president’s speech. But the number of responses is exactly the problem. As the conversation moves toward politics again — starting with the elections in November — the Republican Party is staring down the barrel of an embarrassingly obvious identity crisis, its presumptive shining lights and heirs apparent facing serious legal troubles, and even one of the conservatives’ most ardent water-carrying thought leaders under indictment. The GOP’s current and new disarray calls for a reshake of the party’s Magic 8-Ball for 2016, and raises the question of who — now — is ready to be first getting behind the wheel of the clown car. 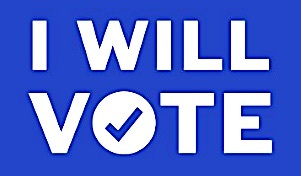 Or, more to the point (and consistent with what the GOP needs), who’s got the gravitas, intelligence and gastric fire to get behind the wheel and keep it from becoming a clown car at all. The Chris Christie piñata contest is well underway. The New Jersey governor just doesn’t believe it yet, and can’t grasp how high and wide the current fiasco already reaches, or the ways in which his style of command indicts him whether paper is served or not. The governor once held up as the Republican hope of the future starts his second term under a deep shitcloud of scandal and possible scandal. The widening of an investigation about Christie administration misuse of the George Washington Bridge plus an investigation into a possible conditioning of Superstorm Sandy hazard mitigation funds on a mayor’s approval of a development project, means the prospects for Christie 2016 are suddenly a lot less favorable than three months ago — and mind you, some considered a Christie a long shot for the nomination before all this happened, Obama hurricane walk notwithstanding. McKay Coppins’ excellent Jan. 18 piece in BuzzFeed documents how the metaphor of shoes dropping is “a favorite among political observers at the moment” on Christie matters, and with good reason. 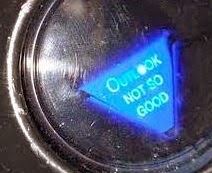 “Everyone thinks there’s probably a 60% chance the other shoe will drop,” said the operative, who requested anonymity. “When I saw the press conference, I said, I don’t think he’s lying… But for the deputy chief of staff to do something like that requires a culture in the office that he would have set, and it probably requires other examples that would have made her feel like that was acceptable to do. WHO’S LEFT?” Cruel online wags circulated that nasty bit of morbid humor after John Entwistle, the bass player for the Who, died in Las Vegas in 2002. But Republicans are asking that same question a lot right now, in the wake of Christie’s implosion. 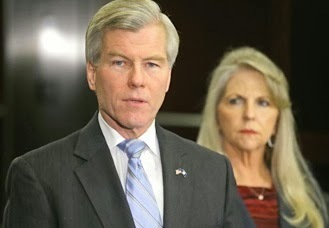 The other former GOP high-flier, Virginia’s Bob McDonnell, has had a big-time reversal of fortunes. On Friday, the now former governor of Virginia and his wife Maureen faced a 14-count felony indictment on federal corruption charges. “Authorities alleged that McDonnell and his wife received gifts from [dietary supplements company Star Scientific] executive Jonnie R. Williams again and again, lodging near constant requests for money, clothes, trips, golf accessories and private plane rides,” The Washington Post reported Friday. The McDonnells face charges from wire fraud and conspiracy to commit wire fraud to making false statements to a federal credit union. Maureen McDonnell also faces a charge of obstruction. It all stems from right after McDonnell was sworn in as governor. The indictment alleges that McDonnell received more than $160,000 in gifts and funds from Williams, a galaxy of gifts and considerations including loans, trips on private jets, shopping sprees at Bergdorf Goodman, a loaner Ferrari, chicken-dinner catering for his daughter’s wedding, and an engraved silver Rolex watch. YOU MIGHT have called it “Groundhog Day” in the NFL: On Sunday, for the second straight year, the San Francisco 49ers’ bid for their sixth Super Bowl title, their first in almost 20 years, died in the end zone, with quarterback Colin Kaepernick missing the hands of wide receiver Michael Crabtree, by a little or a lot. The Niners lost to the Seattle Seahawks 23-17 in the NFC Championship Game with 30 seconds left, when Kaepernick’s pass was deflected by Seahawks cornerback and team avatar Richard Sherman and intercepted by linebacker Malcolm Smith, ending one of the best divisional games in years. The agony of Sunday’s defeat was hard for San Francisco’s diehard sports fans to take, and any rivalry between Seattle and San Francisco thus has real, organic origins on the football field. Both the Seahawks and the 49ers found themselves placed in the same division, the NFC West, back in 2002, so geographic proximity, if nothing else, made some kind of feud almost inevitable. That likelihood increased in 2010, when Pete Carroll was brought in as head coach from the University of Southern California — this a year before Jim Harbaugh, then head coach at Stanford, USC’s college rival, came aboard to coach the Niners. In the years since, the competition between the teams on the football field has exploded into a reflexive rivalry with a life of its own. But upon further review, another part of the rivalry, the one that presumes to set the cities themselves at each other’s throats, may be more convenience than conviction. 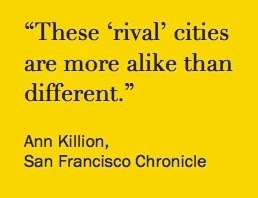 “It was easy for San Francisco to despise Dallas and everything about it. Natural enemies; polar opposites; red state versus blue state. “But Seattle? That's just weird. For San Francisco it’s like hating your twin sister. Like looking in the mirror and despising what you see. “Gorgeous, hilly, waterfront city? Check. “Rich rock 'n' roll history? Check. “And on the football field the teams are much the same, with demonstrative head coaches who came out of the same collegiate conference, budding superstars at quarterback, and nasty, physical defenses. “She’s always been like our more beautiful big sister. We had a big gold rush, sure — 50 years after San Francisco did. You know the 1962 Seattle World’s Fair the old-timers still go on and on about, because it put our city so thrillingly on the global map? We were just keeping pace, because by then San Francisco had already had two. Killion's colleague at the Chronicle, Carl Nolte, thinks all Westneat’s beer-crying was a ruse and a con job, and that Westneat was working some columnist rope-a-dope move. 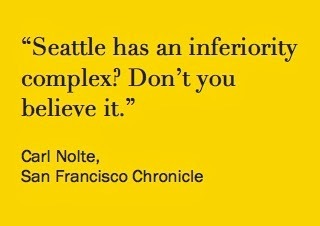 “Seattle has an inferiority complex? Don't you believe it,” Nolte wrote before the game. “The truth is that Seattle is a great place. And Seattle people want to keep it all for themselves. “Think about it for a minute. Seattle has rain. We have drought. Seattle has fresh fish. We have Fisherman's Wharf. They have the Pike Place Market. We have Mid-Market. We have Mount Diablo. They have Mount Rainier. We have Alcatraz Island. They have the San Juan Islands. They have Pioneer Square. We have the Tenderloin. “They even taught us about good coffee. Edward Helmore of The Observer took a day-of-game look at the S.F.-Seattle “rivalry” as a battle of technologies, World War 2.1. Helmore said the championship would “play out a more contemporary regional dispute: the Seahawks are owned by Paul Allen and draw support from Microsoft, the firm he co-founded, and the global shopping behemoth Amazon; the 49ers have established roots not only in San Francisco but increasingly in Silicon Valley, where Apple, Facebook, Google and Twitter have their headquarters. Labels: Ann Killion on SF-Seattle rivalry, Carl Nolte on SF-Seattle rivalry, S.F.-Seattle artificial rivalry, Seattle-San Francisco rivalry, Westneat Seattle rivalry with S.F. NEW JERSEY Gov. Chris Christie declared a state of emergency on Tuesday, to brace the Garden State for the snowstorm that’s just hammered the eastern seaboard. He might as well have declared one for his administration, which is in the early stages of a storm made of a completely different substance. Until late Friday, the governor was facing one deeply problematic crisis, being under fire for his possible role in manufacturing a traffic crisis at the George Washington Bridge as a form of political retribution. Since then, new reporting from MSNBC has led to a completely different headwind for Christie and his beleaguered administration. The mayor of Hoboken has accused the administration of linking the payout of Hurricane Sandy hazard recovery funds to the mayor’s approval of a development project that Christie supports. The details of this theory were logically, brilliantly laid out by MSNBC’s Steve Kornacki, on his “Up” program on Saturday. Kornacki’s an old reportorial hand at Jersey politics; for understanding what’s now at stake for Christie, the report deserves to be experienced for itself, in full. IT WASN’T supposed to go down this way. After his thundering re-election victory in November — a win that spanned the demographic layers common to American politics today — Christie was set for a glide path to the start of his second term. Everything was set to make the start of his second term look good optically, with him taking the oath of office on Tueday, and having a major celebration at Ellis Island, and an inauguration-night dinner at a Jersey City restaurant, and then a foreign trip intended to shore up his bona fides as a potential president. Fast forward to now: He was sworn in on Tuesday at the fitting venue of the Trenton War Memorial, with as much pomp as possible, given the circumstances. That much came off without a hitch. But the foreign policy trip is now postponed as Christie tries to navigate problems at home. The Ellis Island party and the Jersey City dinner were canceled, too. The weather had a lot to do with those two events being scrubbed; it’s gotta be hard to work up a passion for dinner with a governor under a cloud of scandal if you have to fight your way over eight inches of snow to do it. 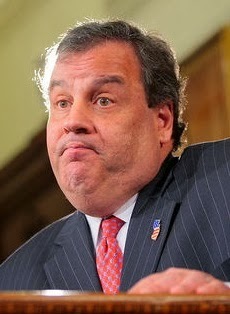 Any way you look at it, though, Christie starts his second term with his presidential aspirations in serious jeopardy. A recent Pew poll shows Christie’s unfavorables — never much to write home about — have gotten worse in the past year, doubling (17 percent to 34 percent) since January 2013. And a new Quinnipiac poll on candidate preference for 2016 has Hillary Clinton up over Christie by eight points (46 to 38) — a complete reversal of the same polling last month, when it was a tossup (41 to 42). THAT POLL, based on assumptions about two people who haven’t even announced their campaigning intentions yet, may be easy for Christie to fuggedabout. Harder to ignore are the feelings of fellow Republicans, one of whom has called for Christie to resign his position as chairman of the Republican Governors Association. FOR NOW (and unless something else blows up) the contours of this debacle are set: Within days of what was to have been a triumphal second-term launch, the Christie administration is under legal scrutiny to determine not just whether a public asset was used for political purposes (and who ordered it) but also to find out whether that administration was prepared to effectively auction its services, and its principles, as a rubber stamp for developers, available to be used by the highest bidder. The Garden State is shoveling out from under serious snowfall. Manalapan reported getting 16 inches, and Piscataway got 10 on the ground. State government offices are closed today. With temperatures expected to hover in the single digits for days, winds will make it feel colder still. And the governor’s personal weather mirrors that of the state he runs. Image credits: Christie inauguration: AP via Yahoo News. 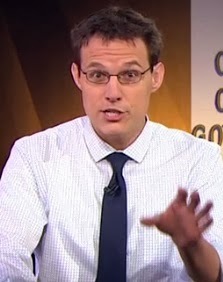 Kornacki: MSNBC. Quinnipiac poll breakout: © 2014 Quinnipiac University. STORM CLOUDS have been gathering for months. We’ve known this was coming, the usual hostilities of competitor networks to be inflamed by bold actions taken late in the evening. On Feb. 17, a latent conflict begins again. After a long lull, the War for Broadcast Late-Night Eyeballs is about to recommence. With the departure of Jay Leno later this month, Jimmy Fallon is set to take the reins of “The Tonight Show,” moving the legendary late-night staple back to New York as the show’s youngest host since Johnny Carson. 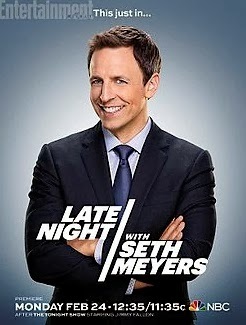 In that one swift stroke, Fallon and NBC put CBS and its late-night comedy institution, David Letterman, on notice, telling them: There’s a new sheriff in town, one whose multiple talents, creative energy and demographic reach add up to a reinvigoration of the “Tonight” brand, and a serious challenge to Letterman’s more static antics. What’s taking shape at the “Tonight Show” may be part of a real generational shift at NBC, which has hinted at other changes elsewhere in its schedule. But in the short term, late-night appears to be the arena for showcasing that change. Letterman would be wise not to underestimate his opponent. In its five seasons, “Late Night With Jimmy Fallon” has grown to consistently outpoint its rivals in the space and to win Emmy nominations for Outstanding Variety, Music or Comedy Series every year since 2010. Fallon, simply put, is an overachiever’s overachiever. A veteran of “Saturday Night Live,” Fallon’s been an actor, he heads a production company, he sings, does wicked impersonations, plays piano, plays guitar (the recent performance with Bruce Springsteen a great example) and is altogether a more kinetic television presence than Letterman has been in years. And it’s more than just physical. Letterman’s interview style, at times sour and cynical, can veer from the sporadically prosecutorial to the passive-aggressive conspiratorial (as though the guest is the object of a joke that only he and the audience are in on). 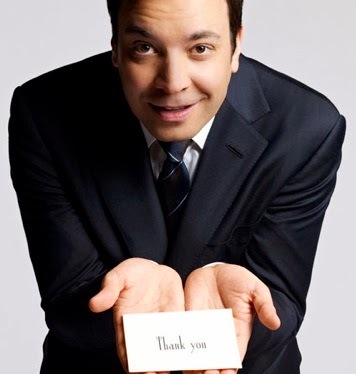 Fallon engages his guests with an unbridled enthusiasm for them and what they’re doing. He never forgets to be the comedian he is, but in his style of inquiry, there’s a sense of celebration, and a visible evidence of empathy. Snark-free, non-ironic empathy. Imagine that. NBC’S SHIFT of late-night resources goes deeper in the bench. 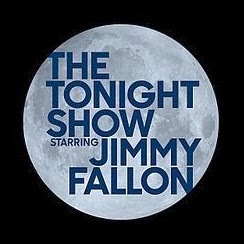 With Fallon’s ascension to “Tonight,” his old “Late Night” perch will be taken over on Feb. 24 by Seth Meyers, late of the Weekend Update desk at “SNL.” Meyers inherits a “Late Night” audience whose ratings (courtesy of Fallon) top those of its counterpart, “The Late Late Show With Craig Ferguson,” on CBS. Whether Meyers can maintain that lead is an open question. His comedic credentials are in order — he can be as good an impersonator as Fallon — and he knows his way around the format, having been head writer for “SNL” (Tina Fey credited him with writing the sketches that skewered Sarah Palin during the 2008 campaign). But on more than one occasion, his timing on “Weekend Update” sketches revealed a comic falling in love with his own material, someone willing to wait for a laugh, and wait and wait, extracting audience responses that the material didn’t always deserve. We’ll see if his chops, and his flow, are in full effect next month. Other changes are coming elsewhere in the Peacock lineup. Tonight, Sasheer Zamata makes her debut on “Saturday Night Live,” becoming the show's first black woman castmember since 2007. The long-running NBC comedy staple has also hired two black women writers, LaKendra Tookes and Leslie Jones, the show's first in more than 20 years. More? 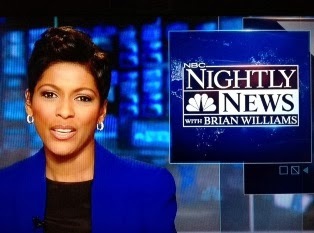 On Jan. 13, Stephen Battaglio of TV Guide reported that Tamron Hall, a fixture of NBC kissing-cousin network MSNBC, “is serious talks with NBC News” to join the “Today” show as a co-host. “People familiar with the discussions tell TV Guide Magazine that Hall will be added to the current line-up of Natalie Morales, Al Roker and Willie Geist,” Battaglio reports. Interesting — if you remember Hall’s recent pre-Christmas stint as a fill-in host of the “NBC Nightly News,” in a position she looked very comfortable in. Oh, Brian Williams isn’t going anywhere; neither, for that matter, is Lester Holt, who helms the “Nightly News” on weekends. But NBC’s nod to Hall’s trial run in The Big Chair speaks volumes about a willingness to put its capable people in unexpected places, to jostle our expectations — to shake things up, at least temporarily. They’ll do it more permanently tonight, and again on the night of Feb. 17. Image credits: All images © NBC and NBC News. ALL THOSE attending these proceedings with interest in matters surrounding the Christie administration’s manipulation of the Fort Lee approach to the George Washington Bridge via Bruce Reynolds Boulevard and Martha Washington Way, advance and be recognized. Don’t everybody rush up at once. There are plenty of tables in plenty of rooms. And we’ve got plenty of time. Apparently, more than we thought. 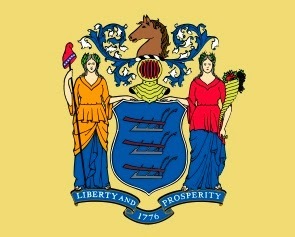 According to the Bergen Record, the New Jersey State Assembly issued 20 subpoenas late Thursday to three organizations and 17 individuals, including Christie spokesmen Michael Drewniak and Colin Reed; communications director Maria Comella; the governor's incoming chief of staff, Regina Egea; Kevin O’Dowd, Christie’s chief of staff and his pick for state Attorney General; David Samson, the chairman of the Port Authority of New York and New Jersey; and Bridget Anne Kelly, Christie’s former deputy chief of staff, whose e-mailed Go code apparently set the scandal in motion last September, and who may be a linchpin in the widening investigation (Headline writers: Who’ll be first to write the head “Bridget Over [or Under] Troubled Water”? Your move.). And even more important, or at least more provocatively, now the principals in scandal dubbed Bridgegate are serious about the legal end of this. The Christie administration announced Thursday it had secured legal counsel in Randy Mastro, former federal prosecutor and deputy New York mayor under Rudy Giuliani. This was about a day after Jim Stepien, Christie’s former campaign manager, lawyered up himself. The stage is being set, not least of all by the governor himself, for a national story in the context of a local event. Few things are commonly recognized and reviled like traffic is; that’s something everyone can relate to. There’s a big-boss-vs.-little-people meme that’s shaping up in the public mind. 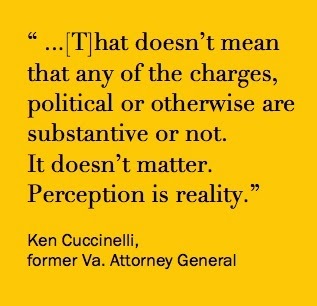 For Christie & Co., there’s no influencing that. 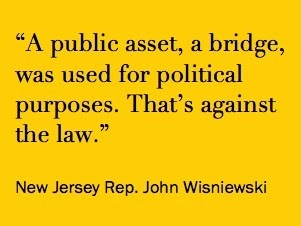 It’s the legal and political dimensions of Bridgegate that matter the most right now. How that pans out, or doesn’t, is what’s hanging in the balance for Gov. Chris Christie. It was with that sense of gravity that he spoke to New Jerseyans on Tuesday afternoon. YOU CAN bet on it: No other State of the State address in recent history ever got so much attention from the national media. When New Jersey Gov. Chris Christie made his annual speech on the economic well-being of the Garden State, he was doing more than offering a perfunctory of his office. 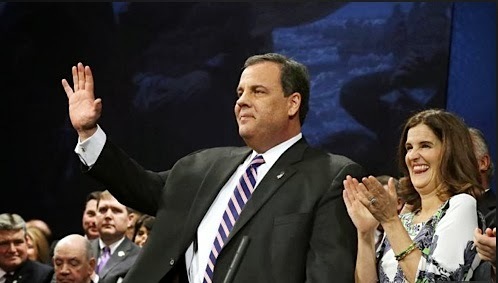 With a huge and spreading traffic scandal as the backdrop (not so much the elephant in the room as it was the elephant as a room of its own) Christie’s speech was a local event with national implications, for no one more than the governor who delivered it. Christie knew what was at stake. When he arrived at the State Assembly in Trenton and took the podium, he wore an expression of deflation, maybe even exhaustion, some of the wind taken out of his formidable sails. He began with an acknowledgement of the widening scandal over his administration’s misuse of access lanes to the George Washington Bridge — a scandal he couldn’t have avoided in the speech if he wanted to. “The last week has certainly tested this administration. Mistakes were clearly made,” he said, offering with those four words a gracious gift to headline writers across America. In his speech, Christie outlined the things that New Jerseyans had a lot to really feel good about. Unemployment in the state was at 7.8 percent, the lowest in five years. The state experienced a gain of 70,000 jobs in 2013, and 156,000 jobs gained over the last four years (of a Christie administration). Personal income for the state’s residents is “at an all-time high,” he said. With four straight years of private-sector job growth, business community confidence is up. And, he said, the state had achieved “with bipartisan support” important milestones, from the expected (balancing a budget) to the welcome (a 2 percent cap on property taxes). IT WAS A strong performance, the second in a short span of days. But the State of the State address, by definition, provides the macro view of the status of New Jersey. This year, by necessity, it’s given us a micro view of the state of the governor in the shakiest period of his tenure as the chief executive of the Garden State. And the shakiness won’t stop for a while; the seismologists in the New Jersey Senate, the New Jersey State Assembly and The Justice Department have work to do. ON NEW Year’s Day at a televised memorial service in Denver, Michael Davis, the father of 17-year-old Claire Davis, forgave the shotgun killer of his daughter. “The young man that shot Claire had a name. His name was Karl Pierson,” Davis said, doing his best to fight back tears as he stood next to his wife, Desiree. 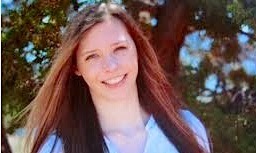 The three mentions of the name of the 18-year-old Arapahoe High School student who killed himself after going to his school on Dec. 13 and shooting Claire Davis with a pump-action shotgun (she died on Dec. 21) were no accident. 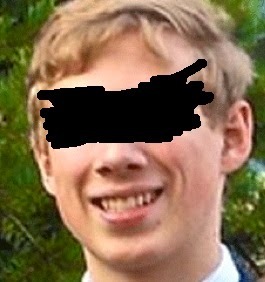 They were a refutation of an idea gaining traction among journalists to petition news organizations to adopt and adhere to a code of conduct restricting, and then eliminating, use of the names of killers in mass-shooting events — to “disappear” their identities, the better to deny them the infamy their actions suggest they are seeking. The idea has gained attention since the mass tragedies of the Aurora, Colo., theater shootings in July 2012 and the murders in Newtown, Conn., last December — and was freshly revived after the Arapahoe High incident. It’s a well-meaning, humanistic and highly thoughtful gesture on behalf of the victims and their families. It’s also exactly the wrong thing to do. 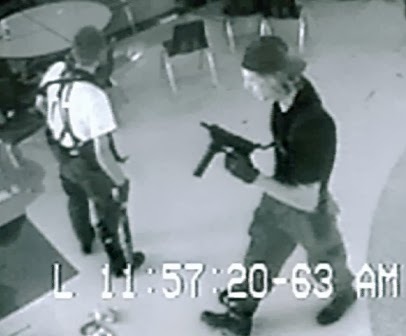 This proposed change in longstanding journalistic practice was started, and has been most passionately advanced, by Dave Cullen, a journalist and the author of “Columbine,” the defining book on the April 1999 massacre at Columbine High School in Colorado. Since the book’s publication in 2009, Cullen has repeatedly cited what he says is the media’s potential role in facilitating other such mass-casualty events. Most recently, Cullen has stepped up his campaign with appearances on MSNBC, and in The Huffington Post, BuzzFeed and The New York Times. 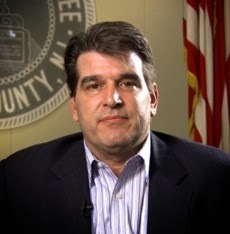 IN A September interview with The Huffington Post, Cullen said that his proposed code of conduct was finding favor with some initially reluctant journalists. “I think people in our business, our profession, are starting to come around,” he said, referencing reaction he received at an April 22 panel discussion on news coverage of violent events and their aftermath, at the Columbia University School of Journalism. But about that F word: Cullen’s argument is an unfortunate conflation of celebrity with identification, one that’s obvious in the words he uses to the point of distraction: “performance,” “star,” “stage,” “marquee,” “spotlight,” “fame.” It’s an unintentional but inescapable swipe at our admittedly celebrity-besotted culture, the pervasiveness of entertainment in the wider society. 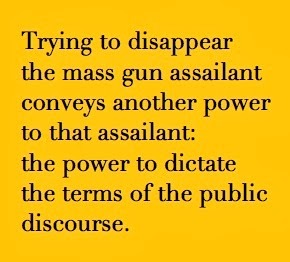 Ironically, trying to journalistically ”disappear” a mass gun assailant conveys other, alternate powers to that assailant: the power to dictate the terms of the public discourse; the power to transform decades of established journalistic practice with a single act — an act that’s still connected to the individual in question, through any number of public records. ONE PROBLEM with institutionalizing Cullen’s doctrine is situational. It’s true that in many recent cases, the gunman never left the scene of the crime; this would make application of his rule relatively easy to accomplish. 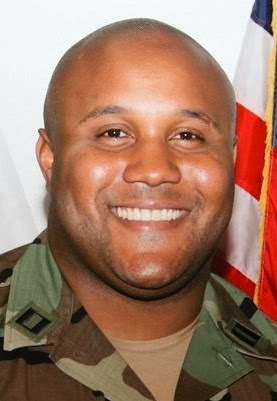 Left undiscussed is the scenario in which a gunman eludes police for hours or days (witness the case of Christopher Dorner, who terrorized southern California for 11 days in February). Under such a scenario, and for obvious reasons, revealing the identity of the shooter is essential to their capture; it’s hard to imagine Cullen would argue with this. But Cullen’s bid to deny assailants the infamy he says they’re seeking would be utterly frustrated, as the name of the man in question is necessarily published everywhere. And under that scenario, or even in the circumstances in which the assailant is immediately captured or killed (by himself or authorities), the killer’s identity is already in the public ether, whether on television, in newspapers or through the eternalizing power of the Internet. In the digital age, it’s impossible to contain the genie of public disclosure once it’s out of the bottle. Cullen proposes an analog-era response to a digital-era event. “Killers are not craving to be googleable,” Cullen says at BuzzFeed, but that’s a surmise at best. In a 24/7 media environment in which vast public exposure is just as easily achieved in a tweet or a You Tube video as on a TV broadcast — and more quickly disseminated — separating one form of public exposure from another is to make a distinction without a difference. Another problem with formalizing such a rule as journalistic practice is determining the threshold of violence that prompts its application. Does the number of victims set that threshold? Does the public status of the victim or victims trigger it? “There is no such thing as bad publicity except your own obituary,” Brendan Behan once observed. The famed Irish writer may not have considered a situation in which that publicity contributes to hastening one’s own obituary — politically speaking. New Jersey Gov. Chris Christie has graced the cover of three national magazine covers in less than two years. This one, from the Jan. 20 issue of The New Yorker, is the third. Considering his current problems, it’s likely to be the one he likes the least of all. IF YOU planned to watch New Jersey Gov. Chris Christie’s mammoth press conference on Thursday — all 107 minutes of it — you’d have been well-advised to bring a lunch. And a violin. The reliably combative Republican governor and possible candidate for the presidency in 2016 went to great length to show the world a new, softer side of Chris Christie. The governor under fire for his possible role in manufacturing a traffic crisis at the George Washington Bridge as a means of political retribution was “heartbroken,” he was “embarrassed,” he was “humiliated,” he was “disturbed,” he was “blindsided.” But as much as anything else, Christie was selective in what he said about the scandal that’s now engulfing his administration, and possibly scuttling whatever hopes he may have had for the White House in three years. At the press conference Christie dutifully kicked certain people under the bus — specifically his deputy chief of staff, Bridget Anne Kelly (terminated “effective immediately”); and his former campaign manager, Bill Stepien, who was effectively excommunicated from any further role in Republican politics in New Jersey. His willingness to accept responsibility for the debacle exploding around him may have repercussions he didn’t expect. New reporting on the scandal dubbed “Bridgegate” by MSNBC's Rachel Maddow, by New Jersey media (and soon enough by everyone else) threatens to unravel the narrative he’s desperately trying to construct. On MSNBC on Thursday night, Maddow went to great lengths to historicize the origins of the scandal more completely than anyone else has to this point, building a provocative but logical case for the birth of Bridgegate going back further than anyone imagined. UP TO NOW, it’s been widely thought that overzealous operatives on Christie’s staff ginned up a massive traffic tie-up between Sept. 9 and Sept. 13 last year as retribution for the refusal of Mark Sokolich, the mayor of Fort Lee, N.J., to endorse Christie’s re-election bid for governor. The traffic madness complicated life for drivers trying to get into Manhattan via the George Washington Bridge on any of three access lanes in Fort Lee, N.J. The lane closures backed traffic up onto Fort Lee's local roads, angered commuters, brought city services to a standstill, and possibly contributed to the death of an elderly woman whom EMS personnel couldn’t reach in time. But Maddow, on her MSNBC program on Thursday night, reached back to explore a genesis for the scandal that extends well before September 2013, and involves someone other than the mayor of a small city outside Manhattan. 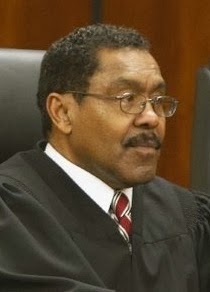 Maddow reported that in May 2010, Christie decided not to reappoint state Supreme Court Justice John Wallace Jr. for another seven-year term, the first such action by a New Jersey governor since 1947. New Jersey Democrats were furious and exacted a measure of revenge by rejecting every Supreme Court nominee Christie put forward after Wallace’s ouster. “Time for some traffic problems in Fort Lee,” Kelly wrote from her Yahoo account at 7:34 a.m. on Aug. 13. Why Fort Lee? The town that was victimized by Christie’s administration, if not the governor himself, is in Legislative District 37, which is represented by Loretta Weinberg. The leader of the New Jersey Senate Democrats. 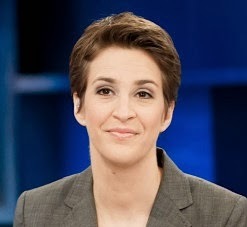 MADDOW’S REPORTING on the matter was as masterful and procedural a connection of fairly disparate dots as any journalist has done on the Bridgegate affair so far, and others will follow her lead. She proposed, however, that the four days of orchestrated traffic chaos were likely intended only as payback for Weinberg’s leadership of the Senate Democrats. It’s entirely possible that it may not be an either/or scenario; there’s every reason to think that the Christie brain trust, mendacity in overdrive, may well have decided on a two-fer, a both/and scenario: punishing Weinberg for her role in scuttling Christie’s nominees, and taking Sokolich down a peg for daring to refuse to back Christie’s bid for a second term. 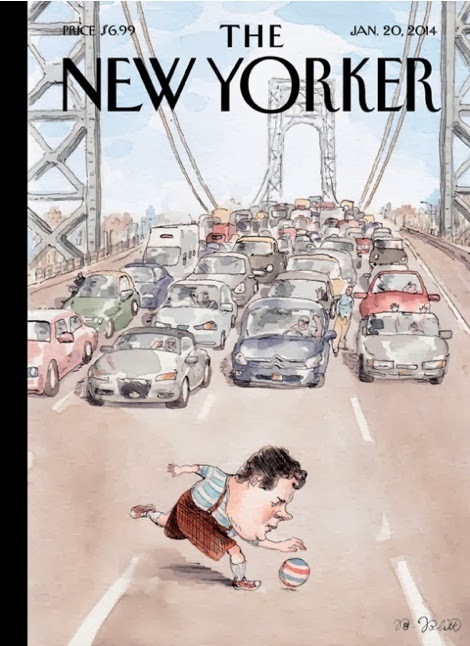 Either way, there are huge problems ahead for Christie. The Aug. 13 e-mail may be the worst of them. Setting aside all of Christie’s protestations of innocence, of embarrassment, of humiliation and all the rest, the resolution of Bridgegate rests on believability, and not Christie’s believability. In this, the Kelly e-mail speaks volumes. 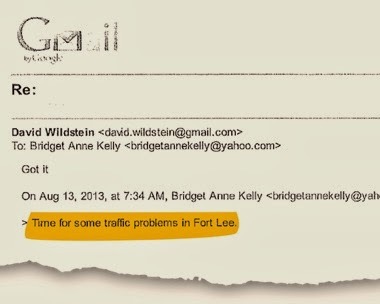 Given Christie’s style of hands-on management, given his reputation for being in charge, it’s just not credible that the Aug. 13 e-mail from his deputy chief of staff — “Time for some traffic problems in Fort Lee” — was written on her own initiative, on her say-so alone, as if dawn rose over New Jersey that morning and Bridget Anne Kelly, having nothing better to do that day, decided all by her lonesome to endanger the lives of people and damage the commerce of industries making use of the busiest working bridge on this planet. If you believe that, I’ve got a bridge — well ... never mind. JUST AS compelling is Wildstein’s response to Kelly’s e-mail, sent one minute later: “Got it.” That reply indicates an antecedent context to the whole conversation. They’ve clearly been talking about it before; the “got it” is acknowledgement of that which has been previously discussed — of an order ready to be implemented. We know how Fort Lee went. 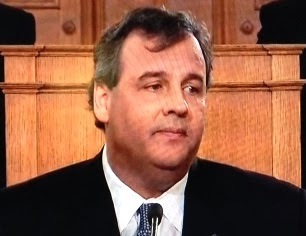 We’ll learn more today, when more internal documents from Christie officials and others are due to be released. We’ll probably learn more in the coming days from Kelly herself; state Rep. John Wisniewski, who led New Jersey lawmakers in calling for subpoenaed correspondence in the Bridgegate case, told Maddow last night that Kelly would be subpoenaed, too. Image credits: Christie: Tony Kurdzuk/The Star-Ledger. Maddow: MSNBC. Wallace: Robert Sciamino/The Star-Ledger. GWB lane closures: Jen Brown/The Star-Ledger. 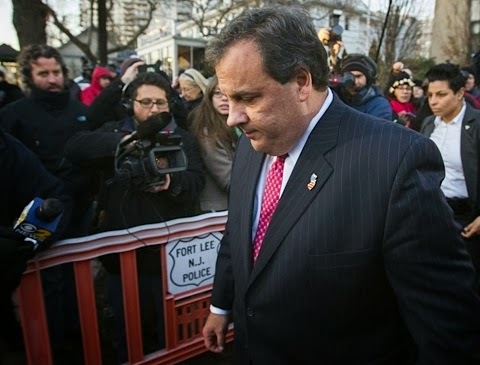 CHRISTOPHER JAMES CHRISTIE, the Republican governor of New Jersey, is in trouble. 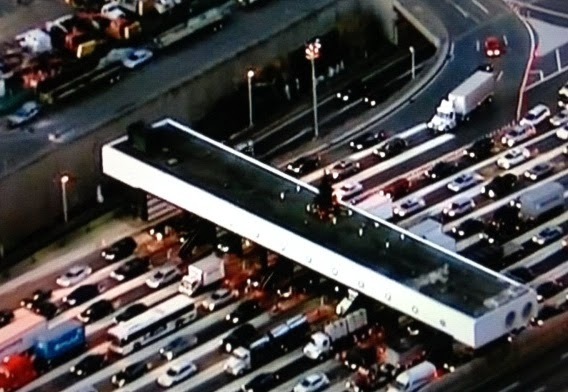 A traffic jam on the access lanes leading to the George Washington Bridge may have gridlocked his plans to achieve the presidency of the United States. Permanently. The fallout from the closure of three of four lanes to the George Washington Bridge, the world’s busiest span, was previously thought to be not much more than a cheeky example of passive-aggressive overreach by zealous state functionaries, rogue operators doing what they thought was a favor of political payback for the governor. But in the last 24 hours, a number of e-mail smoking guns have been obtained by the media, correspondence that lays responsibility for the massive traffic tie-up between Fort Lee, N.J., and New York City inside the governor’s office. Up until now, Christie, the combative governor considering a run for the White House in 2016, has made light of the situation. “I was the guy working the [traffic] cones,” the governor joked at a news conference on Dec. 2. Now, it turns out, the cones may be working him. 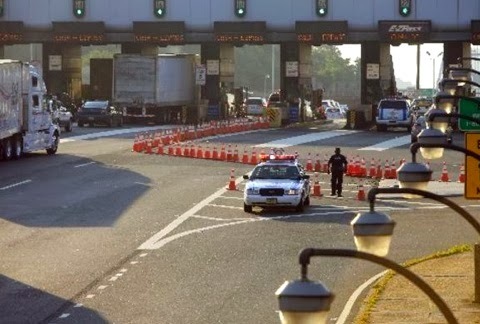 Between Sept. 9 and Sept. 13, drivers trying to get into Manhattan by the George Washington Bridge on any of three access lanes in Fort Lee, N.J., had to contend with those lanes being closed with no warning. The lane closure leading onto the bridge backed traffic up onto Fort Lee's local roads, outraging commuters and snarling city services. The lane closures happened weeks after Mark Sokolich, the Democratic mayor of Fort Lee, refused to join the wave of endorsers for Christie’s re-election as governor — a race Christie won handily, as widely expected. The new e-mails in question were obtained by the media by way of David Wildstein, a former director of interstate capital projects for the Port Authority of New York and New Jersey, and a Christie high school friend. Wildstein provided them after being subpoenaed by John Wisnieswki, the New Jersey Assemblyman who has subpoenaed all correspondence between state lawmakers on the matter. 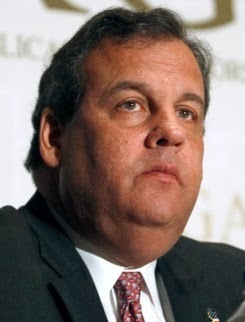 OF ALL the e-mail exchanges between all the officials involved in this widening political disaster, none may be more ultimately damaging to Christie’s current administration and his aspirations for higher office than the first one, an exchange between Wildstein and Christie’s deputy chief of staff Bridget Anne Kelly, an e-conversation that tells the tale of an apparently willful act of payback like nothing else could. “Time for some traffic problems in Fort Lee,” Kelly wrote from her Yahoo account at 7:34 a.m. on Aug. 13, three weeks before the lane closures took place. The full chain of e-mails, many of them heavily redacted, was obtained by the NorthJersey.com Web site, of the Bergen Record. But it’s these two messages that appear to show a deliberate plan to orchestrate a four-day commuter nightmare on the access lanes leading to the busiest bridge in the world. WHAT I’VE seen today for the first time is unacceptable. I am outraged and deeply saddened to learn that not only was I misled by a member of my staff, but this completely inappropriate and unsanctioned conduct was made without my knowledge,” Christie said in a boilerplate-outrage statement released at 4:29 p.m., hours after the e-mails were first disclosed. It was to be expected. Christie clearly transmits the notion that he’s shocked, shocked to find his subordinates acting so recklessly. But here’s the thing: Gov. Christie ends up sideways on this matter, no matter how it turns out. At the very least, the GWB affair means that an assertive, hands-on governor with presidential pretensions is leading a staff over which he has no control, which badly tarnishes his reputation as a leader. At the very worst, it means that this governor is all too ready to engage in mendacious, Nixonian tactics as a way of exacting political retribution ... which tarnishes his biography even more, and trashes his hopes for gaining the presidency of the United States. The gravity of the situation deepens further with the disclosure that the four days of orchestrated chaos near the George Washington Bridge may have led to tragedy. The Bergen Record reported on Wednesday that paramedics were delayed in getting to four emergency medical situations on Sept. 9, including one involving a 91-year-old woman who was unconscious, and who later died of cardiac arrest. MSNBC’s CHRIS Hayes had Wednesday’s best interview get when he talked with Mark Sokolich, the mayor of Fort Lee, who offered his reaction to events of last September. The nagging matter of credibility issue isn’t geographically confined. “This is not a Fort Lee issue, this is a regional issue,” Sokolich told Hayes. Only it’s wider than that, too. This is a national concern. With Christie all but anointed the presumptive frontrunner for 2016, his current problems have serious repercussions for a political party that’s desperate to rebrand its hideous image and widen its appeal. This won’t help a bit. Christie, who was never more than a cosmetic Republican moderate to begin with, made the most of an optical coup walking with President Obama amid the devastation of Hurricane Sandy, which hammered New Jersey right before the 2012 election. And he’s parlayed a reputation as a no-nonsense chief executive of the Garden State, and the state’s relatively strong economy, into a position as the chairman of the Republican Governors Association ... and the mainstream Republican Party’s object of presidential desire. 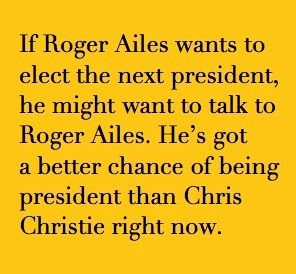 FOX NEWS Chairman Roger Ailes has been high on Christie for about three years. Once, before the 2012 election, he said flat-out that “I want to elect the next president.” Back then, he all but begged Christie to run for the White House; he probably felt that way last year too. And this year ... right up until yesterday. Now it’s all different. Now Christie’s like all the others. A scandal has exploded. E-mails reveal a dialogue that’s more than incidental. And the actions of at least some people in his office may have had a role in the death of a woman in New Jersey. If Roger Ailes wants to elect the next president, he might want to talk to Roger Ailes. At this juncture, almost three years out from the next presidential derby, he’s got a better chance of being president than Chris Christie does. Image credits: George Washington Bridge aerial: Via MSNBC. Christie: AP/Ralph Freso. NorthJersey.com logo: © 2014 North Jersey Media Group. Sokolich: MSNBC.